This week I started with a treat and got out my CiM sample pack. Spacers above of most of them. I haven’t done Peace, Hades, Stoneground, Canyon de Chelly or Khaki – Peace because it is white, Hades because it is an intense black and a spacer would be a waste, and the last three so far because they work best as reactive bases for other things (also because they are expensive and I only have very skinny rods of the first two!). I might reconsider that, though. 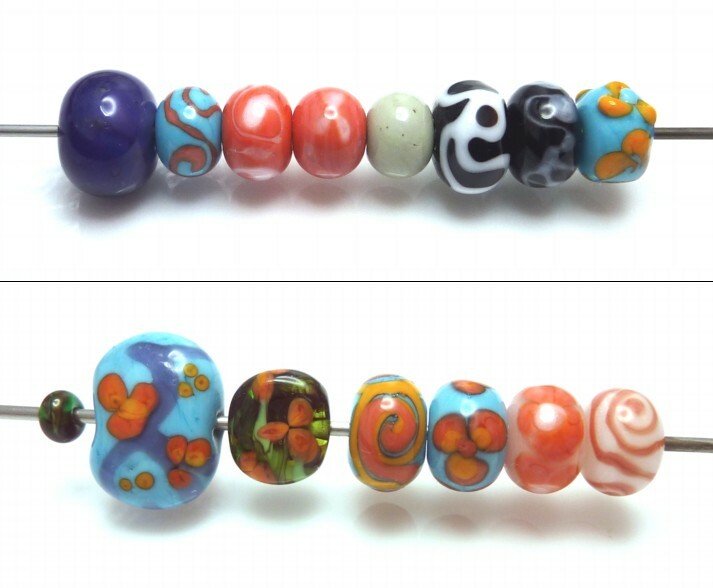 I already know I really like Stoneground from a little bit added to a more recent bead. It’s nice glass to melt – I was particularly impressed by the transparents. Pulsar and Clockwork felt lovely. I’ve noticed that a lot of the opaques got much darker round the mandrel – particularly noticeable on Thai Orchid, Glacier and Celadon. For some reason, I’m still finding it rather difficult to take pictures of red and purple beads and get the colours right if there are other colours in the picture too. Possibly a combination of my camera settings and jpeg compression. The reds come out hugely saturated and darker than they should be. The picture should be reasonably accurate (by my monitor at least!) but the purples should still be a bit lighter. Oh, and Lipstick varies depending on the type of lighting – it’s brownish there but much redder in sunlight or halogens. I bought up someone else’s stash of opalinos – it seemed like a good opportunity to try them out! The UK suppliers don’t tend to carry them and they’re one of the things newbies get warned off because they aren’t always strictly compatible with other colours and burn easily. I really liked them – didn’t have a problem with them getting too hot on my hothead and I was careful but they didn’t seem to be shocky. And I love the results! Here we have nile green, periwinkle and carnelian opalinos. 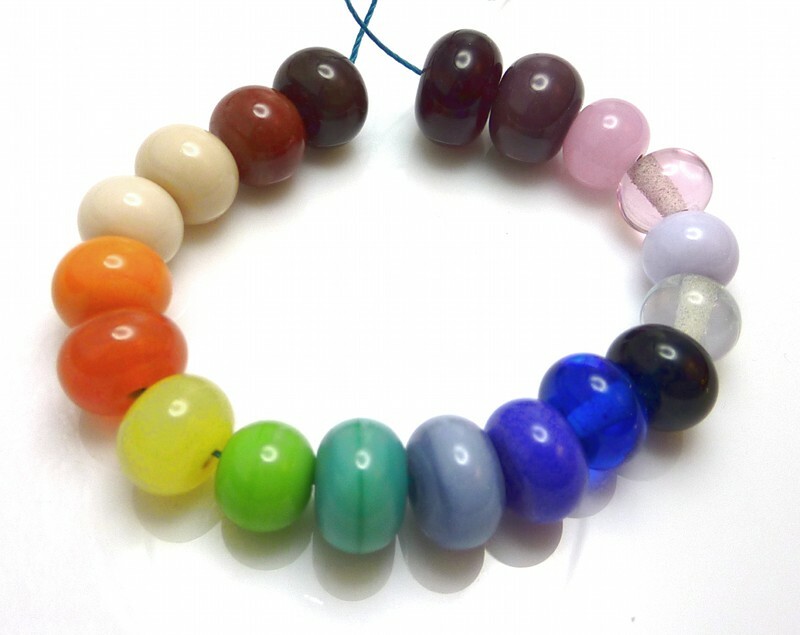 The transparent baby blue bead was me trying carnelian opalino stringer on it – not very noticeable! Then I did some dark turquoise beads with black stringer design. I started doing some experiments with this – it’s the straw yellow plus iris gold frit version. The first pic is just that, wound directly on from the rod and encased in clear. The blues are fairly dark and the whole thing has a slight cola overtone in some lights, particularly noticeable along the mandrel. I think this might have something to do with straw yellow being machinemade now – certainly I’ve seen people saying that the current available batches aren’t as good as older ones. I did a couple more experiments with it this week too – should be in next week’s post! I really like these. 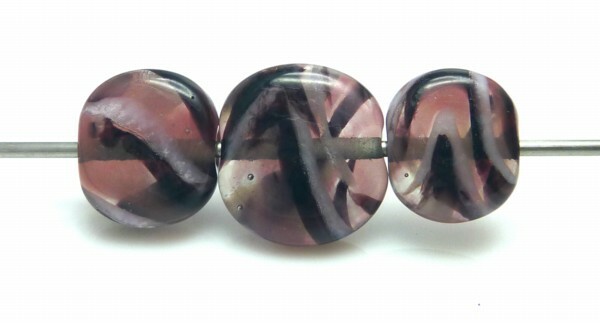 Light grey transparent core, which I handshaped into ovals, then added diagonal stringer lines in black, anise white and carnelian opalino. Melted in, gravity swirled, reshaped and then mashed flat. Pretty! I had to do some mystery colour identification this week. Almost all of the rods in my starter kit were labelled, and the ones that weren’t were mostly duplicates or else easy to work out by looking them up. After my mix-up with turquoise and light sky blue I went through and labelled everything that wasn’t. But I found one rod that looked the same shade as dark yellow, but felt rough like coral, and one rod that looked subtly different from standard white. On a whim, I decided to see if the mango-ey yellow behaved like coral. Yes, it really did. It melted like it too, getting dark purpley-grey when hot. I put it on a turquoise base and made raised florals (on one side anyway, the other side got a bit out of shape so I raked it around and melted it in). When it came out of the fibre blanket, lo and behold I had a reaction line with the turquoise. Just like coral. I went around dubbing it ‘mango coral’ for a while and was wondering if it really was coral, because I know the colour can vary hugely between batches and I think there was a Sunny Mango odd coral at one point. I eventually asked Tuffnell’s about it, because I wanted some more, and Emma reckoned it was 418 pastel yellow. I couldn’t find any mention anywhere of this colour reacting with turquoise (but then again I found very little mention of it at all). So I have some ordered and hopefully the mystery is solved! For the second mystery, I had a suspicion it was anise white. So I very gingerly melted it – anise white is infamous for being extremely shocky and exploding all over the place when introduced to the flame – and made a spacer. There was no exploding. It actually melted really nicely and was even softer than normal white. It looked decidedly different while hot, though, which reassured me that it wasn’t just standard white. My spacer was fairly nondescript with a very slight hint of translucence, particularly round the holes. So I went and asked on FH if there was any way of definitively identifying it as anise, without having to get hold of some intense black and trying to web it. Red Hot Sal (Sally Carver) gave me some very good advice about melting in stringer design on a standard Effetre black base. Normal white will stay white, anise will sink in and get little purple lines in it. 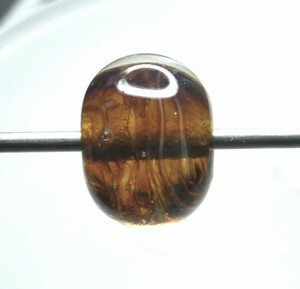 In the two beads at the top right, you can see this very clearly! I have ordered more anise as well, because I really love this rod. I am just hoping that the batch I get is half as well behaved. I spent some time experimenting with various combinations of anise, coral, pastel yellow and turquoise, practising my scrolls and florals. The coral decoration on anise bases were interesting – the coral sinks in a little and makes the whole bead look much more translucent than the anise on its own. 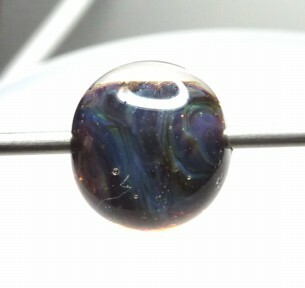 The huge blue/purple encased bead is ink blue over white. Ink blue’s a very dense transparent, so generally you’re going to want to use it over something lighter so you can see the colour. There’s a Vetrofond Odd Quartz Grey spacer in there too. 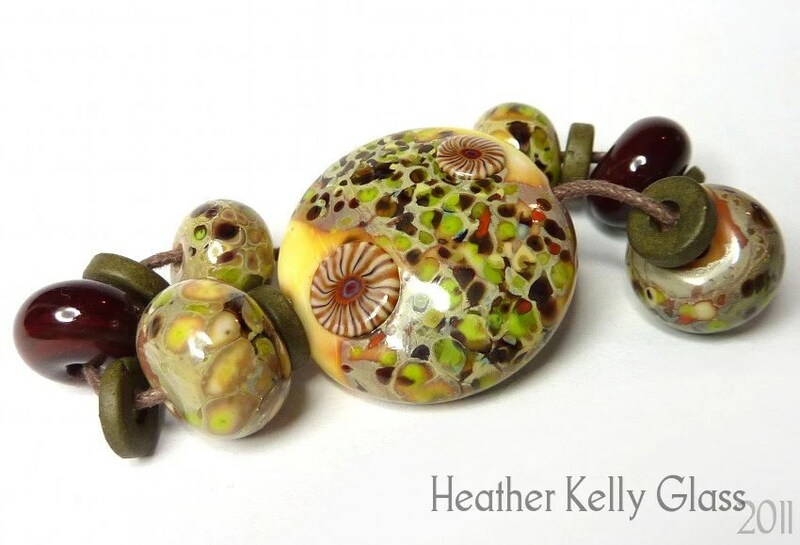 I think I need to do some pressed/mashed beads with the Vetro odds, in the hope I keep their streakiness. On Friday I tried making a vine cane, but it exploded. Well, ok, I got air bubbles trapped in it, tried to pull it out, got a very short, thick cane and then it started exploding when I tried to rewarm it to pull it thinner. Chunks of green all over my workspace! (It was a lime green rod with stripes of pea green, petrol green and black stringer, that was then encased rather badly in transparent grass green). I ended up picking up whatever bits I could get to stick to a mandrel, forming it into a cylinder, mashing into a rough square and adding florals of coral and pastel yellow. I rather like the result (bottom row, third from left). Then I made the big turquoise sorta-lentil. I shaped it with a spoon. It’s got ink blue stringer in the background, which spread a tad more than expected, and more florals. On Saturday I attempted the vine cane again, with much more success! I kept everything hot and marvered flat every stripe of colour I added. No air bubbles and much thinner encasing made the whole thing far more friendly. I still had to pull it twice – first I got something of a decent length but too thick to use for decoration, so I heated it a little at a time and pulled thinner. It’s a bit wiggly because of this, but hey, it’s a vine! For both attempts I started off using the grass green rod as a punty, and with both of them I lost it at some point (this time because I melted a section too thin, so was left holding two rods with cane attached to each) so the pulling was finished with pliers. New gas, and boy was it obvious that my torch had been gradually running cooler and cooler for a while before it ran out entirely – not noticeable until I changed canisters and had heat! So I continued: I made a small tube of clear and used that to pick up vine detritus. I mashed it and tidied up the ends, then added coral and pastel yellow flowers as before. It’s the bead in the middle. Then I made the cylindrical bead – straight vine detritus, formed into a barrel, black added to the ends and anise white flowers added. (It makes lovely flowers!). I finished off with four teeny little spacers in transparent grass green, because I thought the mini gas-ran-out bead was cute.